Is it not when the battery runs out and to not usingsomuch? Even when in a standby state, it is not (3G/LTE, WIFI,bluetooth,etc. synchronous) communication, but it consumes morebattery bycommunicating wait. 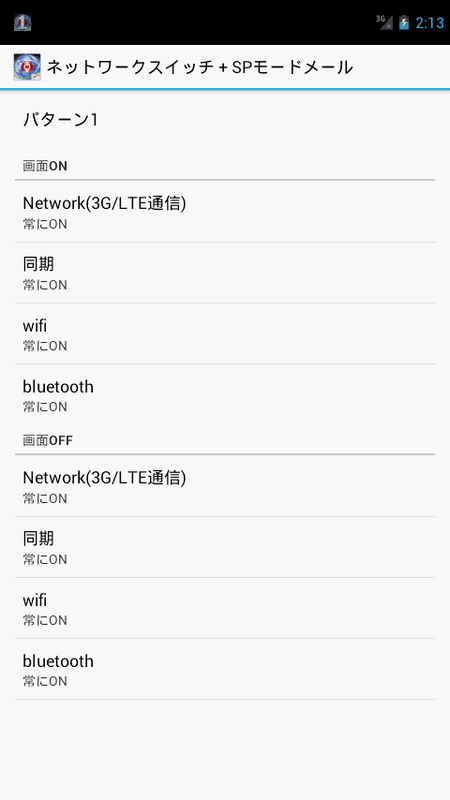 And to resolve it, you may be the ON / OFF (3G/LTE, WIFI,bluetooth,such as synchronous) communication for each power ON /OFF, but thechanges in the widgets, etc. is very troublesome. It is this app is to eliminate such trouble. · WIFI,'s ON synchronization while in the house, but I want toOFF3G/LTE. And batteries because dangerous, I have to stop allcommunicationcalls. Such as, if you can save the settings for your each, you wanttoswitch the setting pattern, you can also easily switchbetweenone-tap the widget. Because there is trial version for one week, thank you inthere,such as operation check. We have received a certified developer certification! Mobile data (3G/LTE), synchronization, this app is a tool thatyoudo automatically without ON / OFF / change Wifi, bluetooth atthescreen ON / OFF. Suppression of unwanted communication in the OFF state,batteryShoryo will greatly improve. You can be Ya to ON Wifi, synchronization depending on thelocationcan be save three settings, Turn ON only when the power isturnedON the mobile data, synchronization, and to always OFFWifi. Also conducted the ON / OFF of the data communicationautomaticallyto match the receiving operation of the SP mode mail,you will benotified by vibration when reception is completed. When 1.3G/LTE had been set to OFF, and when receiving the SPmodemail, and turn OFF is received automatically. 2. I be notified by vibration in SP mode mail is received. 3. 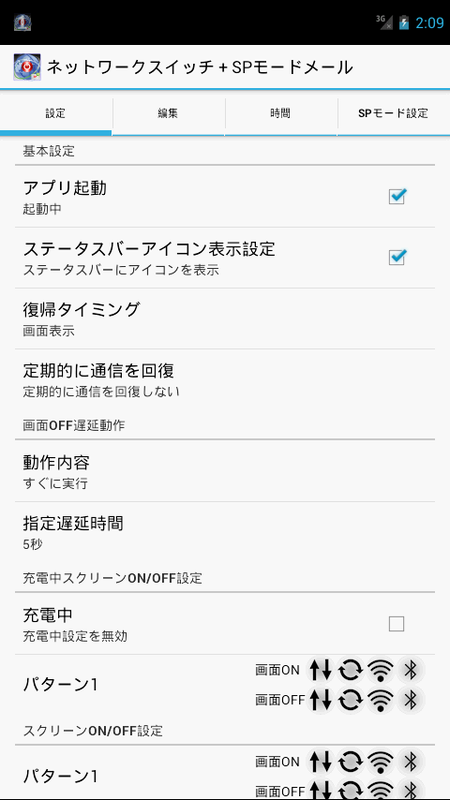 Mobile data (3G/LTE), synchronization, I can change the ON /OFFof the Wifi at screen ON / OFF. 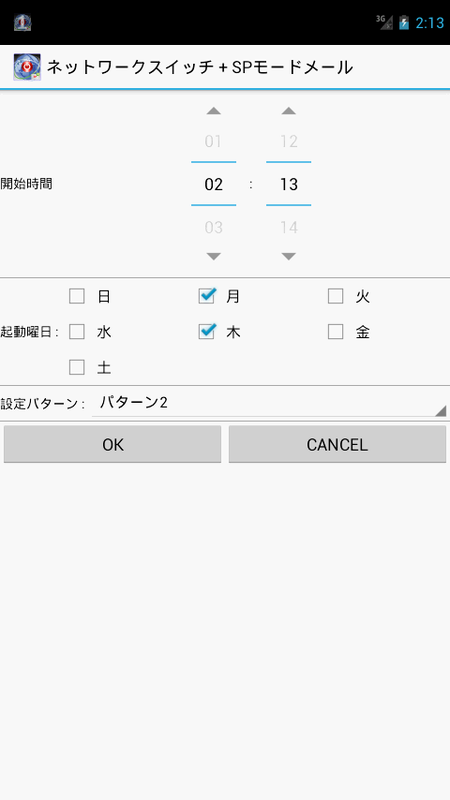 Can be done to switch depending on the situation it is possibletopreserve the settings of 4.5 types, ON / OFF of the screen, itdoesnot have a run during charging / charged. 6. It is possible that SP mode mail-processing is carried outafterthe repeat of vibration. 7. Is ON by automatic mobile data (3G/LTE) in new mail screen oftheSP mode mail, to OFF if you have to OFF (mobile data (3G/LTE)toreturn to the setting state to send upon completion it willbechanged after the completion). ※ I will return to the setting in a few seconds after the end ofthee-mail or edit screen without sending, you open aseparatewindow. 8. Sending mail after, once, twice Vibe sounds the event ofafailure, you know, even if it put in a pocket or be sent, inthecase of success. 10. Time, you can use the day of the week is performedautomaticallychange pattern. -I is operating at 2.3,4. 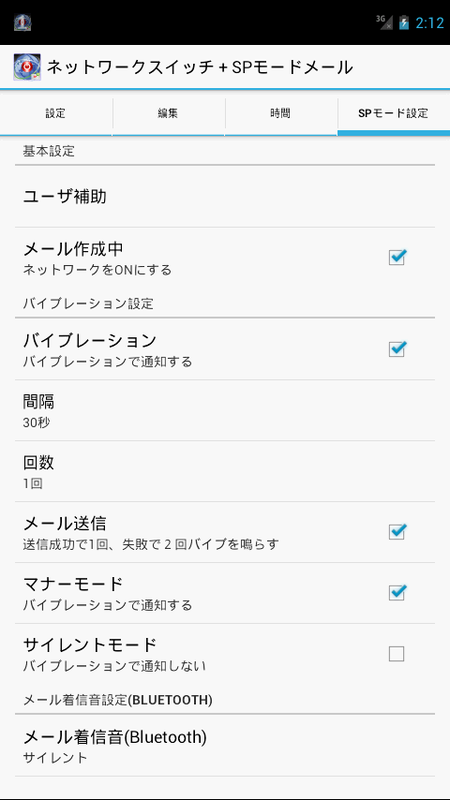 X Android version. Confirmation of the actual machine takes advantage of theAQUOSPHONE SH-01D. 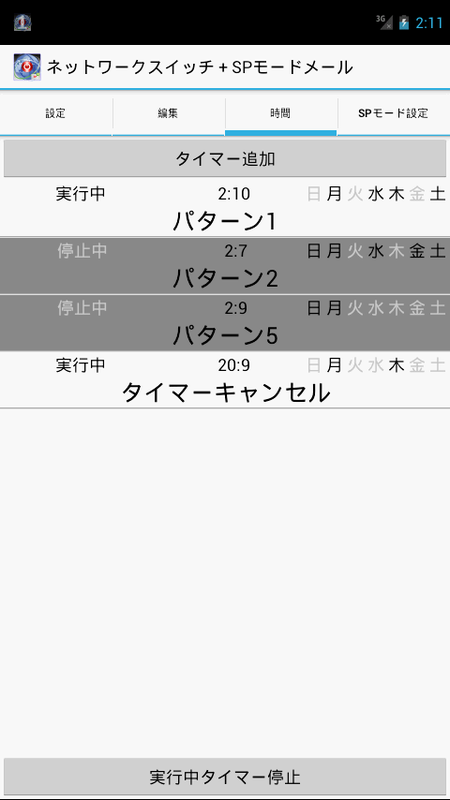 · There is a model that app does not work properly. For this reason, I have been available to the trial versionforoperation check, please try the trial version before buyingthepaid version. · It survives model failure occurs at the time of the trialversion,and able to write the behavior reported in the e-mail orcomment,the trial page. Thank you - at your own risk use in packet saving, etc.. We donotassume any liability even if the communication fee hasbecomeexpensive due to a bug of the application. · For monitoring notification, we use accessibility features. · Please understand that it does not accept any refund ofthepurchase application fee even if you have stopped working duetospecification changes of SP mode mail. · Please avoid the combination with the communicationcontrolapplication of this application other than. There are caseswherethe application does not work properly. And operation might improve may not work correctly if you areusingthe LTE line, but to limit the use of the only 3G network. メール送信／電話のショートカットをホームに作成します。電話のショートカットを作成する場合、宛先の入力欄に電話番号を入力してください。その場合、CCや件名など、その他の入力欄は無視されます。ショートカットに設定できる内容：・ショートカット名・メールの宛先（To:）または電話番号・メールの宛先（CC:/BCC:）・件名・本文・メール作成に使用するアプリ・ショートカットのアイコン簡易的なメールテンプレートとしても使用できます。また、ショートカットごとに使用するメールアプリを別々に設定できるため、複数のメーラーをお使いの方にもオススメです。連携できるメールアプリは、Gmail、ドコモメールで確認しています。※余計な権限は一切持たせていません。その代わり、宛先を電話帳から選択など、便利な機能もありません。※ホームによってはカスタムアイコンが欠けたり、小さすぎたりします。たとえばシャープ(SH-02E)の3ラインホームの場合、アイコンサイズ調整バーを2段階ほど下げてみてください。Createa shortcut to send mail / phone in the home.If you want to create ashortcut to the phone, please enter the phone number in the inputfield of the destination.In that case, such as the CC and thesubject, other input field is ignored.Content that can be set inthe shortcut:Shortcut nameMail of destination (To :) or phonenumberMail destination (CC: / BCC :)·subject·TextApp to be used formail creationShortcut iconIt can also be used as a simple e-mailtemplate.In addition, because you can set up separate e-mailapplication to use for each shortcut, it is also recommended forthose who use more than one mailer.Cooperation can e-mail app, hasconfirmed Gmail, and DoCoMo mail.※ extra authority does not have tohave any.Instead, such as selecting a destination from the phonebook, you do not have any useful function.Or lack of custom icon bythe home ※, and too small.For example, in the case of thethree-line home of Sharp (SH-02E), please try to reduce the iconsize adjustment bar about two steps. This is an application which can return to a home screen only byshaking a smart phone in four directions and the favorite directionat any time. Usage moves simplicity and a seek bar, adjusts thesensitivity of a shake, and is as a switch is turned ON! Excessivebuttons were excluded, it was simple and anyone realized theeasy-to-use interface. If this application is started, even if itdoes not push a home button specially, it can move to a home screenin an instant. A near future operational feeling suitable for asmart phone can be felt. Let me introduce you the best mirrorapplication with useful functions ever!-Simple and clean interfaces.-Eliminate the unnecessary buttons! The entire screen turns into amirror!-Easy to control the brightness by scrolling up and down.-Reversing the mirror-like screen by flicking left and right.-Pause the screen by tapping, so you can check your scalp and backlooking.-Zooming function is very useful when you do makeup.Are you really satisfied with your mirror application? Downloadand try it!Features:-The entire screen turns into a mirror!NO ads at all! Only simple and easy navigation buttons. You can useyour entire screen as a mirror.-Easy to control the brightness.Just scroll up and down to adjust the brightness! It's so easy!-Reversing the mirror-like screen!You can check yourself as how others see you by flicking left andright.-Pause the screenIf you want to check the back of your hair, or while you are inmotion, just pause the screen by tapping! !-Zooming functionsYou can zoom up by pinch in and out on the screen. [Target Device]OS: Newer than Android OS 2.3 version of smartphones.Requirement: Front camera function. 恋人や友達に見られたくないアプリ、ありませんか？このアプリを使えば、チャットや写真、電話帳などの隠したいアプリを簡単にパスワードロックすることができます。■操作は超簡単！隠したいアプリをタップするだけでOK！一瞬でパスワードロックをかけることができます。■万全のセキュリティ！パスワード解除に失敗した侵入者をバッチリ撮影！無音なので気づかれずに撮影が可能です。※フロントカメラがあるスマホのみ対応の機能です■こんな人におすすめ！・恋人以外に気になっている人がいる・異性の友人と頻繁に交流している・浮気だと誤解されそうな写真を持っている・恥ずかしい写真を持っている・過去の恋人との写真やメールを保存している・現在の恋人が嫉妬深い・恋人が勝手に携帯をのぞいてくる・親が勝手に携帯をのぞいてくる・友達/同僚が勝手に携帯をのぞいてくる・子供の誤操作が気になる■衝撃の調査結果！彼氏の携帯をのぞいたことがある女性→74%！彼女の携帯をのぞいたことがある男性→49%！※モバゲーリサーチより抜粋アナタの携帯ものぞかれているかも...隠したいアプリだけロック(アプリ金庫)で今スグ対策！■Q&A：ロックが上手く動作しないロックが上手く動作しない場合は、下記2点をご確認ください。・携帯電話の節電機能を利用する際は、本アプリを対象外にする。・メモリ解放アプリを使用する際は、本アプリを削除しない。※削除してしまった場合は、スマホを消灯状態にするとロックが復帰します。■Q&A：パスワードを忘れてしまったパスワードを忘れてしまった場合は、本アプリを削除していただくと、アプリに設定されたロックが解除されます。アンインストールした後、再度インストールして新しいパスワードを設定してください。その他、質問やご要望がございましたら、レビュー欄からご連絡ください。何卒よろしくお願い申し上げます。app you donot want to be seen and friends lover, isnot?Using this application,Applications that want to hide chat andphotos, such as a telephone bookIt allows you to password lock easily.■ operation issuper easy!OK just tap the app you want to hide!You can put a password lock in an instant.security of ■perfect!It is perfect shooting the intruder failed to releasepassword!It is can be taken without being noticed silence so .※ smartphone there is a front camera is a function only of thecorrespondenceRECOMMEND this ■!-There are people who are worried about the non-lover- I'm in frequent interaction with friends of the oppositesex- I have a photo that seems to be misunderstood's cheating· I have a embarrassing photo-I have to save the e-mail photos and a lover of the pastReviews the current jealousReviews come except for the mobile on its ownParent comes except mobile without permission- Friend / co-worker to come except for mobile withoutpermission- Incorrect operation of children is aconcernfindings ■ Impact!Women → who have had except the mobileboyfriend 74%!Men → who have had except the mobile phone ofher 49%!※ excerpt from MobageresearchMobile youalso may have been look into ...Now anti-lock in (application safe) only app you want tohide!■ Q & A: lock does not workIf the lock does not work well, please check the following twopoints.· When youuse the power saving function of the mobile phone, it is notsubject to thisapplication.• When usinga memory release app, you do not remove this application.※ If you accidentally delete, lock to wake up to the smartphone offstate.■ Q &A: you have forgotten your passwordIf you forget the password, lock it and you'll delete thisapplication, set the app is released. After you uninstall, pleaseset a new password and re-installthem.Others, Ifyou have any questions or requests, please contact us from thereview column.Humbly thank you.